Co-authored by Matteo Carbone, director of the IOT Insurance Observatory and co-founder of Archimede Spac, and Atanu Sarkar is Vice President of the DataLeverage business at ValueMomentum. 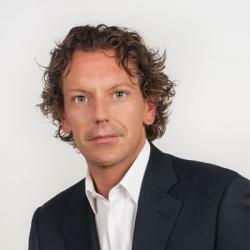 This article is featured on the Carrier Management “Innovation and Strategy” and also appears on Matteo Atanu‘s LinkedIn page. During her commute, Chloe decides to stop at a name-brand franchise for a cup of coffee. In a moment of weakness, Chloe – a diabetic – elects to consume a fresh-baked pastry along with her java. Fortunately, Chloe’s smart glucose monitoring system sends her an alert quantifying the size of the impending spike and she responds appropriately to avert any issues. In the afternoon, Chloe’s home heating system detects a part is on the verge of failure. It generates a signal which triggers an automated process that orders the needed part, contacts a service provider and schedules the repair. Moments later, Chloe receives a notification of the impending breakdown as well as the day and time of the repair appointment, which she quickly confirms – via an app on her phone – and, using the same app, books a florist visit during the repair time frame to get some expert advice on an issue with her house plants. In the evening, as she arrives home from work, Chloe’s proximity disarms the household alarm and adjusts HVAC accordingly. After a healthful meal and her nightly yoga routine, Chloe sits down to finish reviewing several mortgage offers for the new home she’s buying. Working on the mortgage causes Chloe to think about other ways to protect her family, so she clicks on a banner ad for a customized life insurance product. After staying up beyond her usual time, Chloe retires for the night. Today, most of us are familiar with basic forms of the electronic connectedness known as the Internet of Things (IoT). We obtain driving directions from our smartphone assistant, order pizza via smart speakers and control smart home devices with an app. But Chloe’s level of game-changing level of automated, integrated and interconnected IoT will arrive sooner than many people realize. As numerous consulting firms have discussed, businesses are in the process of becoming interdependent within and across categories. This will dissolve traditional industry boundaries and replace them with a set of distinctive and massive ecosystems clustered around fundamental human and business needs. In this article, we’ll review the current state of the Insurance IoT, explore what’s needed for future success and provide an executive-level overview of the technology considerations required for gaining favorable outcomes in an interconnected world. Although IoT is most common among InsureTechs, industry-wide efforts to harness Insurance IoT are in their infancy. Many insurers are still focused on modernizing their core systems. Most are still struggling with defining what it means to transform into a “digital insurer” to meet escalating user experience expectations. 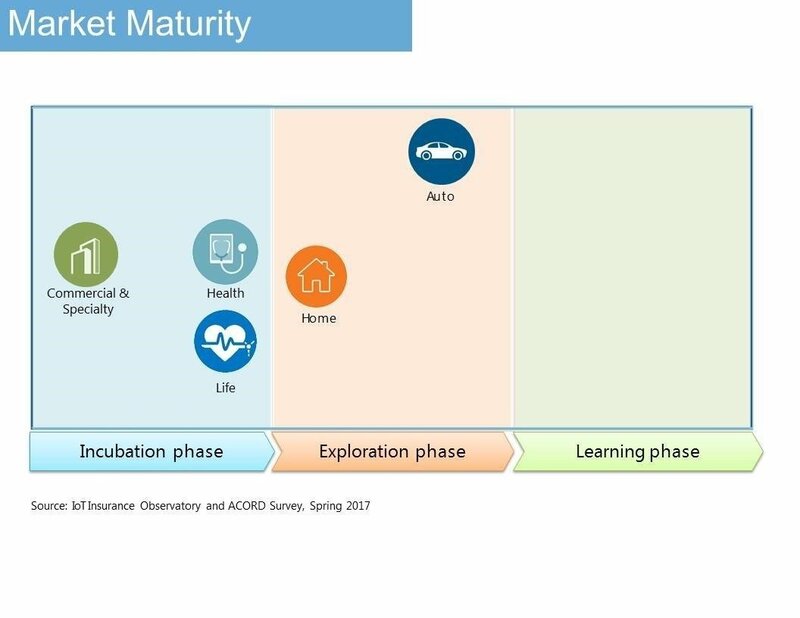 As the accompanying overview graphic “Market Maturity” suggests, the majority of early Insurance IoT initiatives have concentrated on one type of IoT, telematics, in personal and commercial auto lines. In the U.S., adoption is still minimal, with many initiatives having not yet to realize a positive ROI. However, insurers have clearly grasped the larger potential as the traction and evaluation of new entrants, like Root, have raised the market’s attention and sense of urgency. We’ve also seen some property Insurance IoT efforts around residential and commercial structures. There, the focus has been assessing the impacts of mitigating various risks. By and large, even the most advanced initiatives are in the piloting or developmental phases, as insurers conduct research on sensor types, analytics tools, management systems, human interaction layers and adoption barriers. Progress among health insurers is similar to property. Early efforts range from offering fitness trackers to arming chronic obstructive pulmonary disease (COPD) inhalers with sensors for automatic tracking of medication use. Again, initiatives are in early phases with real-world outcomes and profitability impacts yet unknown. Moving forward, there’s little doubt the insurance industry will accelerate its Insurance IoT embrace. The true winners will be those who understand the real value proposition of Insurance IoT, which are the opportunities for value creation and sharing that ultimately boost an insurer’s bottom line. 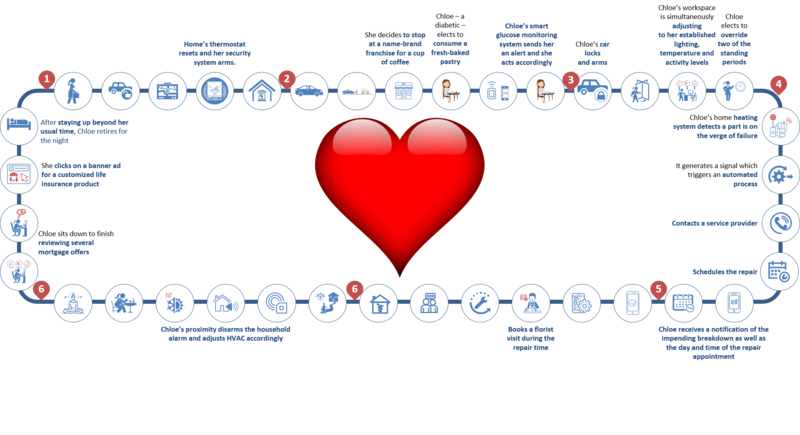 To visualize how Insurance IoT improves bottom lines, compared to traditional approaches, see the graphic portraying the respected “Insurance IoT Value Creation Framework”. This waterfall framework was created by the IoT Insurance Observatory, a think tank representing over 50 North American and European enterprises, including ValueMomentum. The Observatory also includes six of the top U.S. P&C insurance groups and four of the top seven global reinsurers. Additionally, let’s review some examples drawn from Chloe’s life, which illustrate the framework’s building blocks and how insurers benefit. First, Chloe’s renter’s insurance is a smart policy, offering more than monetary reimbursement when something bad has happened. Her insurer sold her a safety and security service for a monthly fee. Moreover, the insurer connected its systems to her smart home infrastructure and even added some water leakage sensors that were not previously present. The insurer created and manages the automated process that gets triggered by the signal from the heating system, enabling the insurer to intervene proactively. Further, Chloe’s insurer receives revenues from its preferred service providers, like the repair technician and the florist, who pay the insurer a fee for automatic access to fulfilling Chloe’s needs. Although the policy Chloe selected permits her health insurer to raise her deductible for chronically engaging in risk-elevation activities, such as the contra-indicated pastries, reduced standing periods and sleep deprivation, Chloe chose this product because her transgressions are infrequent. As for the health insurer, it gains a self-selected lower-risk policyholder. 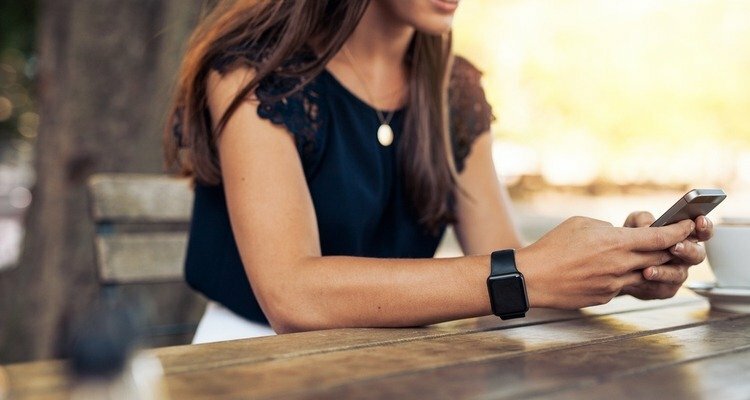 Chloe’s health insurer is also involved in her hyper-connected day, proving the glucose monitoring system together with an app that supplies Chloe with 24/7 access to a network of nutritionists. Chloe also receives a preferred rate for the monitoring and coaching, which reduces the insurer’s claims costs. Some of Chloe’s other activities also reduce risks and create value. This includes automatically securing her home against intrusion, keeping indoor spaces the proper temperature to avoid infrastructure incidents and damage from frozen pipes, not to mention wearing and heading her glucose monitoring system. Chloe’s insurers benefit from the reduced probability of Chloe submitting a claim. As for Chloe’s morning stop, she obtained her coffee for free by redeeming a QR code from her auto insurer sent as a reward for driving a certain number of miles at low risk (no hard braking, speeding, phone distractions, etc.). Previously, Chloe’s auto insurer had negotiated a very favorable rate on the coffee because the chain would benefit from cross and up sells, like Chloe’s impulse purchase. Chloe’s insurer reduces the risks to its book of business with this inexpensive behavior change mechanism. In the evening, when working on her mortgage prompted Chloe to shop for life insurance, she opted-in to permit the life insurer to obtain her health records, wellness activities from her mobile phone and the current contents of her refrigerator. In real time, the insurer calculated Chloe’s life score and created an exceptionally accurate quotation. Next, the insurer presented Chloe with a competitive quote based her age, lifestyle and health history. Due to all of the positives, Chloe now loves her insurers. However, before her life was hyper-connected, she felt insurance was more of a necessary expense than a beneficial experience. Not only was her risk exposure greater, but she never received any rewards from her insurers. What’s more, Chloe’s insurance premiums were over 20% higher. By leveraging IoT data, Chloe’s insurers have created bottom line value, a portion of which they share with her via discounted prices and other incentives. 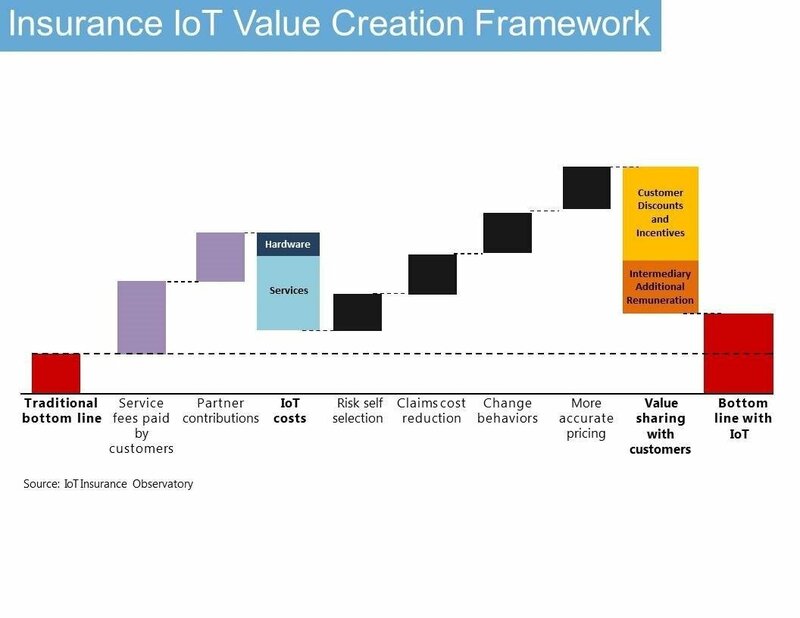 This value creation/value sharing model embodies Insurance IoT’s transformational potential. Once you’ve fully appreciated the business value embedded in the dozens of IoT data points your policyholders create every minute of every day, you can begin to acquire the appropriate technology capabilities for gathering, analyzing and acting on the IoT data in real time. Although this journey will involve numerous steps, a good starting point is understanding the seven primary technology layers required for Insurance IoT and the key considerations for assembling them into a complete solution. 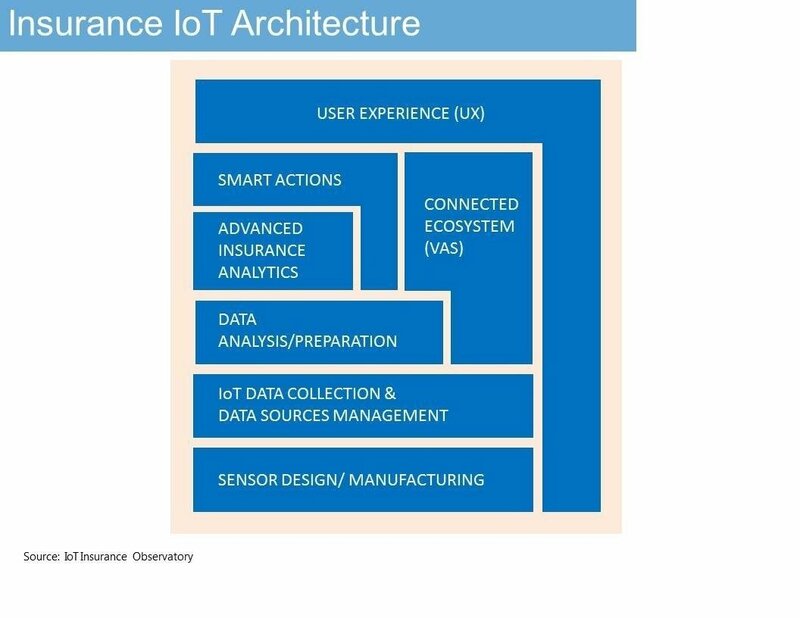 For a visualization of these layers, consider the graphic “Insurance IoT Architecture” framed by the IoT Insurance Observatory. Devices that collect IoT data can range from simple purpose-built solutions, such as a water flow detector, to complex devices that incorporate multiple types of sensors, like a smartphone. Although there’s no single “correct” type of sensor to use for any given application, it’s vital to consider both what data a given sensor is, or is not, gathering and how the sensor is collecting the data as each significantly impacts analytics abilities and outcomes. Upon collection, data must be transferred for storage to a location where it, and other collected information, can be properly processed, managed and accounted for. In the early days of telematics, industry-specific solutions handled this layer. Now, as Insurance IoT scales up to require data gathering from millions of policyholders, who are each generating thousands of different types of data points every nanosecond, this layer is quickly moving to mega-vendor platforms, like Microsoft Azure. Such platforms are purpose-built for fast transfer and management of vast amounts of information, plus they provide other services like device management, data security, resiliency, load balancing and ease of integration with other systems. All of these capabilities are vital to real-time Insurance IoT. From this layer, forward, success depends on partnering with experienced solution providers who demonstrate a granular understanding of insurance nuances, ranging from rating requirements to loss specifics. Whether you’re developing a proprietary technology layer or adopting a purpose-built solution, partnering with experienced consultants and integrators is the most effective means to achieve your end goals. Within Layer 3, collected data from all real-time, non-real time, internal and external sources gets normalized, interpreted and prepared for insurance-related purposes. A simple homeowners’ example is a combination of real-time data from smart sensors, both real-time and historical climate data from external providers and policyholder data such as contact information and preferences. The most advanced solutions for this layer now included advance algorithms and machine learning capabilities, speeding the normalization, interpretation and preparation chores. In this off-line layer, advanced analytics are performed on the data from the Layer 3 to create proprietary algorithms and models that are applied in subsequent two layers. A workers’ comp example is the probability of injury based on historical claims data combined with various external data sources. Or, in an automotive scenario, risk indicators that would predict a loss cost for a particular type of accident based on a particular type of vehicle on a specific type of roadway under a specific type of climatic conditions. Arguably, it’s within Layer 5, and its close cousin Layer 6, where the real-time “magic” of Insurance IoT occurs. In other words, these layers translate the data and information from the forgoing layers into activities insurers can use for differentiating themselves and taking advantage of new opportunities in order to stay competitive. The technologies in both Layer 5 and Layer 6 can be comprised of internal systems, cloud-based solutions or a hybrid. Specifically, Layer 5 rapidly applies algorithms and data from the previous layers to result in smart actions related to traditional insurance activities such as underwriting decisions, pricing calculations, claims management, and cross-selling. This layer can be thought of as a neighbor to Layer 5, rather than a vertical step up. This layer contains the partnering services and all of the interconnections required for the utilization of those services, as illustrated by Chloe’s story. However, the possibilities go far beyond those we’ve presented, making innovative thinking key to competitive success. Naturally, any successful Insurance IoT deployment will involve integrating all of the forgoing back end processes and systems with the front end experience presented to policyholders and prospects. Such experiences should be designed as a mixture of digital and physical interactions, as Insurance IoT is characterized by combining automated processes, triggered by data, with human engagement. Note that positive user experiences depend not only on the appropriateness of each interaction, but also on appropriate timing. This ensures policyholders and prospects receive what they need, when they need it, rather alienating users with distracting interactions that cause confusion or create interference. Regardless which of the scenarios we’ve presented apply to your business, or where on the connectivity spectrum your enterprise is today, it’s clear the opportunities inherent in the Insurance IoT offer vast possibilities for improving your bottom line and becoming beloved by your policyholders. Given the rapid paradigm shifts already underway, the greatest risk to insurers is delay. In short, the time to start building and executing your Insurance IoT strategy is now. I’m working in Bain Financial Services practice and spent most of my time advising many of primary Players on Italian market. I’m recognized by the client and team as expert on key issue and emerging trends in insurance and wealth management sector. I dealt with Mid-level and Senior Clients, developing advisor status with Executive and earning confidence for contribution to quality output and recommendations. I have wide experience with major International Insurance Groups.